Discussion in 'Students' started by Robin, Apr 16, 2019. Appearance Description: Tilly’s steel-coloured eyes, paired with her platinum blonde hair, give her a strangely ethereal appearance, though this rarely shows through, as her face almost always sports either a smile or a curious glint. She’s rather small in stature, standing at just five feet and weighing just a hundred pounds soaking wet. With a smile like the sun, rosy cheeks, and a winning complexion, it’s hard not to like Tilly on first impression. She has a pair of brown wire-framed glasses that she rarely wears, reserved almost exclusively for her private studies of arcane lore. It’s not so much that she’s embarrassed to wear them as she simply hates wearing glasses of any kind. Things on your eyes, you know? When it comes to attire, Tilly likes to keep things simple and comfortable. She’s unlikely to be seen without her school uniform. She often wears a sweater with her uniform, and prefers a skirt and a pair of warm leggings. 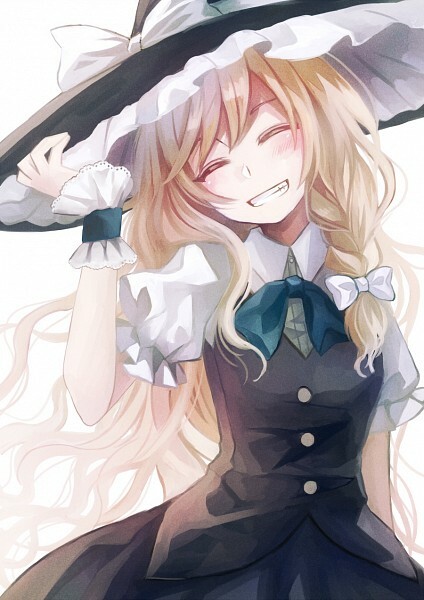 She is quite fond of her sole custom addition to this uniform: A tall, wide-brimmed, pointed black hat. Floppy, impractical, and utterly ridiculous though it may be, there’s nothing that makes Tilly feel more at ease than this trusty piece of headwear. On the rare venture she might take into the realm of modern clothing, one will find that her clothing style is nostalgic, but that’s mostly because she gets most of her things at a thrift store. One might even call her eccentric, and more than once, she’s been spotted wearing a set of wizard’s robes, ranging in a variety of colors and sporting a menagerie of symbols that change with the seasons. Personality Description: Determined and headstrong, there’s nothing that can impede Matilda when she sets her mind to it. The largest driving force behind her actions is her emotions, and Matilda is quite quick to anger, just as much as she is quick to love. While some might find her passionate nature charming, others will see that it makes her rather easily manipulated, if you know just what to say. It’s quite easy to make her jealous, and she tends to have trouble forgiving those who have slighted her. Matilda is an old soul, in part because her two best friends growing up were her grandmothers. Many have observed that she seems wise beyond her years, but it might just be that she’s a bit old-fashioned. She's also quite cheery, always trying to sport a smile when she isn't deep in concentration. Her grandmas taught her to smile and the world smiles with you, and that just what she aims to do. Aside from her overbearing confidence, Tilly is a bit of a nervous wreck. She easily gets overloaded by anxiety, which comes in abundance when involved in a social situation, especially with new people. She likes people, to be sure, but she is quickly exhausted by prolonged social interaction. Typically she deals with these emotions with self-deprecating humor, or in the case of being forced to interact with people she does not like, glib sarcasm. Her favorite thing in this world, beyond all her hobbies and desires, is magic. She wants to learn all there is to know, to wield power beyond her wildest dreams. She’s already quite compulsive, but when it comes to the arcane arts, her nature is revealed to be obsessive. She often spends hours each day locked away in her room or in the library, studying. Tilly is also quite secretive, even with information that really should be shared, or is obviously known. She’s quite tight-lipped about almost any information she has that you don’t, particularly her own secrets, though she’d certainly make a good confidante. She’s quite introverted by nature, so you’d have to initiate that particular conversation yourself if you seek that sort of relationship with her. Naturally, she’s yet to come out to her family, though perhaps the change in scenery to a much more accepting place will spark change in her confidence. Alchemy is a subtle, delicate art, almost closer to science than magic, depending on who you ask. It is not a “Bangs and smells” sort of art form, which is why what Tilly calls Alchemy is nothing short of an affront to any self-respecting alchemist. Tilly’s form of alchemy is based more on feelings and belief then actual ingredients and properties. It allows her to imbue a drink with the effects of a spell that she knows. To create a potion, Tilly must gather five ingredients, each stimulating one of the five senses, each tied together by a theme of the potion’s effect. For example, a healing potion might contain a bit of cough syrup for taste, a band-aid for texture, a small red cross for sight, clinical disinfectant for smell, and the steady beeping of a life support machine for sound (Some ingredients are gathered more metaphorically then literally). Amazingly, even if some ingredients are toxic or completely inedible, the potion will always go down smoothly and cause no effects except the one it was meant to. Every spell that can be turned into a potion will have a description included of how its effects change when adapted this way. Potions are about 20 ounces of liquid, and must be drunk in their entirety to take effect. Only one potion may be consumed at a time, as mixing effects can be quite dangerous. Tilly may only create one potion at a time. Upgrading this power as if removing a limit will allow her to create one more potion per upgrade, effectively giving her another “slot”. Tilly is free to produce a potion during a topic as if she had prepared it ahead of time, so long as she has potion slots available. Tilly may upgrade this ability as many times as she wishes. Brewing a potion takes about an hour, but upgrading this ability will allow her to brew multiple potions in the same period of time. Allows Tilly to imbue an object with the magical properties of a spell that she knows. This effectively grants the holder of the item a free cast of the spell imbued using the item as a focus, even if they themselves don’t know the spell. Some spells have different effects when enchanted, but these effects should be detailed on the spell's description. Anyone with much knowledge of the arcane should be able to detect and utilize her enchantments relatively painlessly, however, those who don’t know magic or magical theory of any kind won’t have much luck. For these folks, Tilly may add conditional triggers to the object, such as making a sword enchanted with the fireball spell only work when the sword is swung, or a necklace of healing only activate when the wearer is struck with a major injury. As of now, an enchanted item may only carry one use of a spell before being depleted, at which point, the magic fades completely. Also as of now, Tilly may only create one enchanted item at a time. Upgrading this power will allow Tilly to increase the total number of uses an enchanted item has OR how many enchanted items she may create at once by one, per upgrade. Tilly can upgrade this ability as many times as she wishes. Enchantments remain indefinitely until used. An object with spent charges must be recharged by Tilly, which takes about half as long as enchanting it would. At the start of each topic, Tilly may possess any enchanted item, so long as she is able to create it. If she has given an item to someone, this will reduce the available enchantments for this effect in kind. Enchanting takes time and focus, and so cannot be attempted in combat. The process takes an hour at the minimum. Enchantment abilities do NOT use Vancian Magic slots. Many spellcasters benefit from their own personal stores of energy, drawing power that comes as naturally to them as breathing or walking. For Matilda, her power comes from hard work, lots of practice, and diligent study. To use a spell, Tilly must spend about an hour memorizing a spell from a tome. When she casts a spell, all that work is lost, and she’ll have to memorize it again. She begins each topic with one spell slot. Casting any spell will expend a spell slot unless otherwise noted. Upgading this ability as if to remove a limit will increase her total available number of spell slots by one, as well as decreasing the relative time it takes her to learn each spell by half each time (Though the per topic limit may never be removed, nor may this weakness). Tilly's available spells are listed below, divided by magical categories. Abjuration’s domain is magic that deals with healing or protection. Spells can range from healing wounds to curing diseases to even allowing someone to breathe underwater or walk through flames. A spell for healing physical wounds. So long as physical contact is sustained between the caster and the target, the healing rate of the target’s body is increased dramatically. The healing rate of the target is increased so that one day’s worth of healing occurs in just one second. For targets already possessing healing factors, this is obviously much more dramatic, but in those who heal normally, this means that simple injuries can be healed in a matter of moments, and more dramatic injuries such as broken bones can be healed in a minute or less. This only empowers the body’s natural healing factor, so injuries that one couldn’t naturally recover from will only be stabilized. She can continue healing someone this way for up to 30 seconds. When used as a potion or enchantment, the effect causes constant healing for a full thirty seconds at this rate. Because this spell speeds up the body’s natural processes, it actually makes poisons and diseases more effective, so using this on a victim of such ailments is inadvisable. Pyromancy is the art of producing and controlling magic in the form of flames. It is most often used offensively, though some forms of magic focus more on the spiritual implications of fire, such as light, life, and purification. Generates a ball of fire, typically from the palm of Tilly’s hand. The ball quickly expands to a half meter in diameter, and flies in a straight line towards a target until it makes contact with something large, such as a person, or moves 50 meters away from the caster. At this point, the fireball will combust, expanding to a 5 meter diameter in a fiery explosion. If made into a potion, will set the drinker on fire, or can be thrown. Shattering the bottle will result in the bottle exploding as if a fireball had been cast on the point of impact. For every spell that Tilly learns, she may gain a Rote related to the spell learned. Rote spells do not consume spell slots of Vancian Magic when used. Rote spells should have little to no use in combat, and serve largely household or convenience roles. This section will be updated as Tilly gains more spells. If a Rote is enchanted onto an item, the enchantment will never drain unless Tilly manually removes the enchantment. Allows Tilly to generate a small amount of flame, either using her thumb like a cigarette lighter to hold a flame for a light, or lighting a nearby source within ten feet, such as a few candles or a fireplace. Treats basic injuries. Can cure headaches, stop bleeding in small cuts, soothe pain in burns, etc; Can’t treat anything that couldn’t be treated by a household first aid kit, but does it moderately faster. Tilly has gained a functionally Eidetic Memory through the Method of Loci, also known as the "Memory Palace Technique." While not inherently supernatural, it does display an above average control over her mind. It is also different than total recall. As long as she has time to think on it, she's able to recall any memory, but she will not be able to immediately remember things that she normally couldn't. Almost everyone has some degree of awareness of the supernatural, whether or not you realize that’s what is at work. Chills down your spine, a subtle feeling that something is simply wrong about a place, the hairs on your arm standing up for no apparent reason, something tickling at the edges of your vision—these are your primal awareness of something nasty and supernatural treading nearby. Tilly has learned to sharpen this feeling through her arcane studies and natural aptitude. This gives her some insight into the inherent nature of a person, creature, or object that acts as a source of magic: It will generally allow her to see what a spell, creature, or object is for, but not exactly what it does. (Example: Tilly uses her senses on a magical barrier and gets a general sense of how strong it is relative to her own strength, and also finds that it was placed there to hold people inside, not to keep outsiders out. She might also learn that the barrier has traps in place, should it be broken, though she wouldn’t know specifically what the trap does, or she might be able to tell that a vampire feeds on humans, but not what they consume or how they do it.) This ability also gives her the ability to (faintly) detect magical illusions. She’ll get a small spine-tingly feeling of warning, but won’t know the nature of the illusion, who is casting it, how strong it is, what it’s hiding, or anything like that. Her supernatural senses are tied directly to her mortal senses, and are limited to a range of 25 meters from her person. Regular exposure to natural energies can empower the human body, which is why the cultural image of a centuries-old wizard in a tower actually checks out. Because of this, once Tilly reaches physical maturity, her aging process will rapidly begin to slow. Her lifespan is functionally indefinite. In addition to this, Tilly’s constitution enables her to recover from injury much faster than a normal human could: An injury that might lay a normal human up for a week will probably see Tilly out on a pair of crutches the next morning, walking with a bit of a limp the next day, and good as new the day after that, not even a scar to show for it. In addition to this already fabulous boon, her constitution is different in that she can recover from nearly any injury, regardless of severity. This does not make her more durable. A bullet to the head will still kill her, same as anyone else, but given enough time (Likely months or even years) she might be able to regrow a lost limb or heal burns that were supposedly permanent. Tilly’s brand of magic does not like to play well with technology. She emits an uncontrollable field of mana static that varies from annoying to dangerous. Rarely, technological constructs close to her will short out or break when near her seemingly at random. The closer to her and the more complex the technology, the more likely it is to break. When she uses her magic, this effect grows far more common. Typically, the more powerful or complex the spell she works, the more havoc she’ll wreak upon technology. Casting a spell in a moving car might cause the car to break down, or trying to have a conversation on a cell phone while preparing a spell might destroy the phone entirely or drain its battery completely at best. The target of a spell cast by her is all but guaranteed to suffer from this static. Biography: Matilda Dorothy Charlotte Blackstone was born on All Hallow’s Eve in the year 2002. She likes to pretend this date is significant, that it means something special of her, but really it just means that after hours of gathering up massive stores of candy, she and her friends growing up had been able to return to her house and gorge themselves on cake and sweets. Tilly is from Traverse City, Michigan, and she had a decidedly pleasant childhood, all things considered. Her father, Jonathan Blackstone, ran a touristy magic shop in the mall, while her mother, Christen Blackstone, managed a gourmet restaurant downtown. They got by comfortably enough, though early on, they couldn’t afford a sitter for her, so Tilly was usually sent to stay with her grandmothers when her parents were working. Dorothy Blackstone and Charlotte Dierich were lifelong friends who to this very day seemed filled with childlike wonder that their children had married and made them in-laws. When they both became widows within the space of a few years, it seemed only natural to move in together. Tilly loved her grandmothers, and never minded going to visit them. Her grandmothers lived out in the country, and had hundreds of acres of forest for her to explore. When she grew tired of that, they would read her stories and teach her things. Matilda always loved those woods. They bordered on her best friend Blaine’s house, and the two of them would explore together, crafting fantasy worlds and finding new landmarks, building forts, and otherwise getting up to the kind of fun that two kids might have. The only place that was off limits to them, and therefore the most tantalizing, was the house on the northern border of the property. It looked abandoned, but the two always swore they could see shadows moving around inside. One of their favorite games to play was to see who could get closest to the house. They’d take turns moving towards it, until they finally got spooked and bolted. They kept track of distance mostly by landmarks. The furthest Tilly had gotten was the tire swing. Blaine made it to the stairs once, but came back screaming the whole way, all the way through the woods and back to their house. When she asked her grandmothers why the house was off limits, they’d always gone on about “The things in the cellar,” which was cryptic and therefore only more mysterious. Her mom told her it was just them being mystical, and in reality, it was likely just a rodent infestation or some other kind of nasty animal. At school, Matilda was seen as something of a nerd, and while she was generally liked, she didn’t really run with the popular crowds. She was far more into the DnD group she played in then she ever would be into a party, and she preferred running track and cross to basketball or softball. Most sports bored her, but there was something peaceful in just running on her lonesome. She was, for all intents and purposes, a cliched track and cross nerd. As the two grew up together, Blaine and Tilly grew more and more inseparable. In fact, their relationship quickly turned confusedly romantic when the pair entered the psychological turmoil of puberty. Their first kiss was spontaneous, random, and incredibly awkward, initiated on a whim by Blaine. Though the two were quite affectionate, ridicule at school was enough to drive them apart. They tried to stay friends, but things were never the same, and their feelings for each other just made it worse when they were together. As she got older, the things Tilly’s grandmothers taught her grew more and more complex. At first, it was only stories, anecdotes and life lessons about creatures and powers that lurked beyond the natural world, hidden from view. As she grew older, however, these lessons became much more practical. Her grandmothers were minor talents, capable of some small amount of magic, mostly limited to just household chores, and Tilly was no different. In fact, she displayed absolutely no magical talent, even with the tutelage of her grandmothers. Still, as she grew up hearing these stories and learning of this world, she had to keep trying. She pored over every book she could find, every spellcasting manual and every supernatural journal she could get her hands on. She even gave the necronomicon a try. Nothing worked. Though the power her grandmothers possessed was only modest, their introduction to the magical community lit a fire in Matilda’s heart, a thirst for power, and a desperate need for talent, any at all. Just enough to be a part of that world. The candles that littered the shop all came alight at once, casting the store in a golden light as she stared down at the tome in disbelief. The book was reported destroyed during transit to the shipping company. Tilly’s dad never saw the book again. In fact, a few strange orders even came through for books with no return address that neither Christen nor Jonathan remembered ordering. They vanished into Tilly’s room just as quickly. She quickly became something of a recluse as these studies began to overtake her life. Tilly was a wizard now, and every wizard needs their reclusive tower, after all. The only thing that managed to draw her from her metaphorical tower was Blaine, who stopped in unannounced one day. They were older, now, and they’d grown up a bit from those days before. Not only that, people had become a bit (Just a bit) more accepting. Hell, two of the girls that used to bully them had came out this year. Blaine didn’t even want to be together, per se. Just to be friends again. Her proposal? A walk in the woods, just like old times. As she turned around, holding her hands in the air triumphantly, the door flew open, and a pair of pale, clammy hands seized Blaine by the hair, dragging her inside. Another shape, silhouetted in the dying light, emerged, coming straight for Tilly. She’s not proud of it, but Matilda ran. What could she have done? She turned on her feet and took off. All her years of running for sport paid off tremendously, as she bolted up the lawn, past the dog house, around the shed, and over the fence, leaping like a gazelle. She didn’t have time to turn and look, but she could still sense footfalls behind her. She had to get away, had to get away… Halfway to the house now, just a bit more, a minute more, she could see it! Blaine’s shrieks filled the air, and she faltered. Missed a step, lost in thought, and tumbled to the ground. She recovered quickly, but she’d lost some ground. Was she seriously going to leave Blaine behind? What could she do? What couldn’t she do? As she reached the steps of her grandmother’s house, Matilda Blackstone turned on her heels. Her pursuer, now illuminated for the first time, was most definitely not human. Humanoid was pushing it, though it did walk on two legs. She didn’t have long to consider it, however, and as this was a particularly unpleasant memory, it’s not something she’ll be visiting in her palace any time soon. One hand lashed out towards the creature, who was now just ten meters from her. Her lips rang with defiant energy as she cried out her inantation. The creature was consumed by flames, and there was naught but ash left behind. Quickly, she bolted up the stairs to her room, grabbing a twenty ounce pepsi bottle, a big stick, and the shotgun that Grandma Blackstone kept under her bed. Then she ran. The journey seemed far longer this way then it had the last, and the house was eerily silent now. As she caught sight of the northern border, she flew over the fence, past the shed, around the doghouse, and past the tire swing, never pausing as she reached the house, kicking the door wide open. She raised the shotgun, but found that the room was empty. She kicked down the first door to her left, which proved to be a kitchen, also empty. She checked up the stairs, the gun readied to fire down every corner as she searched the house. Realization dawned on Tilly’s face, and as she searched the floor, she noticed a patch of rug that was lopsided. Kicking it away, she discovered a trapdoor. She stared at it, mouth agape. Then, she swallowed hard, readied the gun against her shoulder, and set the staff on the floor. She lifted the firearm with one hand, undoing the latch with the other, and lifted it, as quietly as she could. The sight made her gag. A menagerie of corpses, strung up like pigs at the butcher, hung everywhere. Each was in a varying state of decay, but only one was still moving. Blaine was being lifted by the other creature, struggling wildly as she fought with all her might to avoid being dropped onto a meat hook. Without thinking, without caring, Tilly lifted the gun, centered it on the creature’s back, and pulled the trigger. A slew of hot buckshot sent the creature, and Blaine with it, to the ground. She was up in a moment, and the creature in a moment more, giving chase even as it bled from orifices that did not exist mere moments ago. As Blaine bolted for the ladder, Tilly let another shot fly, knocking the creature to the ground again. She could see movement out of the corner of her eye. There were more of them down there. Those… Those things on the hooks were beginning to stir... Beginning to chase after Blaine. She wasn’t going to make it. She was on the ladder now, but there were hands reaching out for her, grazing her clothing. She didn’t have time to reload. She dropped the gun at her side, scooping up the staff, and leveling it over Blaine’s head. A ball of flame just missed Tilly’s best friend, and impacted the ground, sending the creatures that had begun to encircle Blaine sprawling and setting the room ablaze. She lowered the rod, scooping her up like a shepherd, and hauling her up. She slammed the door behind her, and jamming the shotgun between the bars to hold it tight. Hand in hand, they ran the whole way, Tilly dragging Blaine along. Resources: Tilly definitely doesn’t have many household electronics. The laptop and flip phone provided to her as a student are just simple enough to avoid damage, so long as she remembers to wear her bracelet, but even still, she keeps such things in her locker to avoid unnecessary property damage. She receives a modest allowance from her parents, enough to procure most of the things she needs or wants, though particularly expensive additions such as rare books will require weeks or more of saving. Your character has been approved! You may now start roleplaying with your character. If your character has a business or organization, remember to post in the relevant forum and do claims for their business. To get started with roleplaying, you can check out the Plots forum and reach out to other players, or see if you can fulfill any connections in the wanted ads forum. You can also find open threads (or post your own) on the open topic listing. Have fun!